A representation of the exchanges of energy between the source (the Sun), Earth's surface, the Earth's atmosphere, and the ultimate sink outer space. 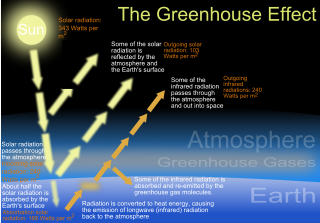 The ability of the atmosphere to capture and recycle energy emitted by Earth's surface is the defining characteristic of the greenhouse effect. Energy flow between the sun, the atmosphere and earth's surface.